It's officially September here in Washington and that means the summer is ending. Although summer break hasn't ended for University of Washington students just yet, the start of the rainy season is upon us! So while the cooler weather has begun its slow creep back into our lives the past few weeks, the sun decided to make its final (probably?) stand this week! So it good Seattlite-fashion we had to take advantage of it! One thing that I love about living in Seattle is that people here go bananas over good weather. When the sun comes out, the parks will be packed and shorts will be worn...regardless of temperature. Washington does parks well, and Sammamish is no exception. There is a great park right down the road from us that has a fun little splash pad for the kiddos, a full playground, a giant grass field, and a beautiful pavilion. So my dear friend Kirsten invited us out to the park to get the last semblance of a tan to last us all winter and get our kiddos out of the house before the cabin fever of winter starts to set in! I love these fellow moms so much. We have felt so lucky to move into a neighborhood where we have made so many friends so quickly. These ladies and their sweet kiddos are such a blessing to me, and they are just a snapshot of the relationships that we have begun to build in Sammamish. 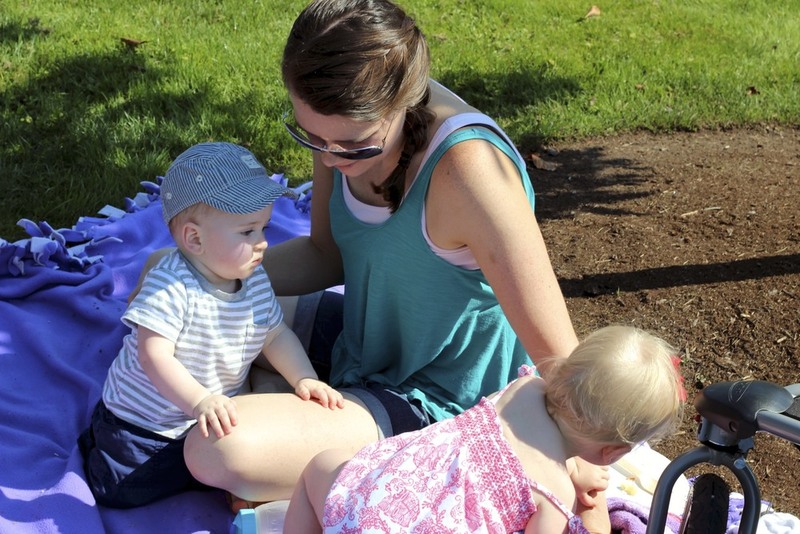 Hooray for park babies and summer sun! Looks like next time we meet up at the park we'll be in our galoshes and rain coats! That's okay though, I'm terrible at summer clothes. I hardly feel myself without my boots and trench coats. I guess that's what living your whole life in Washington will do to you.